Roll the dice, using number counters, kids count out the number they rolled. 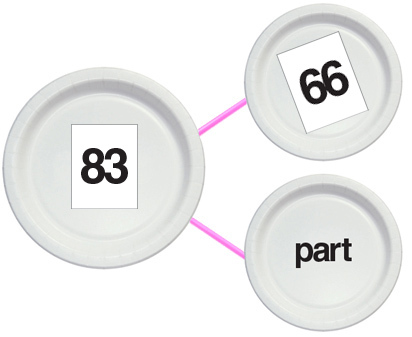 Then, they place the number counters on the whole plate. They roll again, count out the number with their number counters, and place the counters on one of the "part" plates. Whoever figures out the missing part and places the correct number of counters on the plate first gets a point! You can also use money. 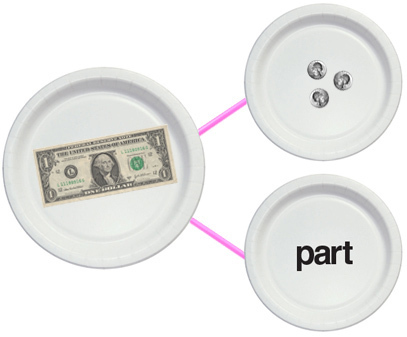 Ex: place one dollar on the whole plate and some coins on one of the part plates. Kids figure out the missing part, counting out coins. Kids pull two number cards from the pile. They place the larger card on the whole plate and the smaller card on one of the part plates. The first one to figure out the missing addend gets a point! I love your number bond game and see that you use Singapore math. I was wondering if you'd like to join my collaborative board on Pinterest that's all about Singapore math. If you'd like to just go ahead and go to the board and follow. Once you're following I will add you as a collaborator and you can start pinning your resources from your blog or TpT. The only requirement is that the items be about Singapore math/number bonds/bar models/etc.